Home Uncategories Pangasinan 'Flesh Eating Disease' Prophecy by Sadhu Sundar Selvaraj is coming true? 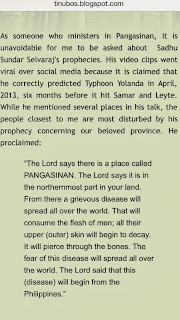 Pangasinan 'Flesh Eating Disease' Prophecy by Sadhu Sundar Selvaraj is coming true? Failed to catch that Bandila report last night, Feb. 24, 'coz I attended an indie movie screening ("Unfriendly") at the Robinsons Galleria. Allegedly, according to Selvaraj's prophecy during the 24th National Prayer Gathering in Cuneta Astrodome, a grievous disease will spread all over the world and it will start in Pangasinan. He said that the disease will rot the skin, the flesh and the bones. 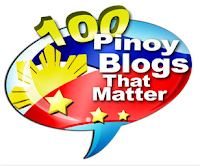 about the Pangasinan disease. Who wouldn't? Selvaraj is the same prophet who prophesied about the earthquake in Bohol and a super typhoon in Samar and Leyte (Yolanda / Hainan) which both came true. to lose if we pray, pray and pray. Only God knows what lies ahead. I've always believed in the power of prayer. Let's ask for His forgiveness and pray for our countrymen in Pangasinan.